Why should I use divorce mediation? Divorce mediation gives you the best opportunity to settle all the issues related to your breakup with dignity, efficiency and fairness. It saves you time and money. It has less emotional cost. It is better for your children. You and your spouse decide how, when and under what condition your divorce will occur. You are not subjected to the protocols, schedules, the unpredictability, and the adversarial approach of the legal system. You and your spouse together can expect to spend about $2,500 for the divorce, which includes mediation and attorney prepared legal documents. Less, if you have no children and your affairs are not complex. Hudson Valley Divorce Mediation does not require a retainer. We charge an hourly rate of $180 for your mediation. The parties participating in mediation share this fee, in some ratio that makes sense to them. Divorce mediation is an economical choice. If you litigate your divorce, the legal battle can cost, for each of you, $25,000 to $50,000 or more in attorney fees, even if you are not wealthy. In addition, “cost” not only means dollars spent, but also the emotional cost to you and your children brought about by long, drawn-out and bitter legal proceedings. A divorce mediator is a trained neutral professional who assists you and your spouse in your communication and negotiation, and help you reach agreement on your divorce settlement. The mediators at Hudson Valley Divorce Mediation are committed to support both of you, and will not favor one position over another. They guide you through the entire process of getting a divorce. With mediation, is the divorce a legal divorce? After you and your spouse have agreed on all issues related to your breakup—especially divisions of assets and debts, parenting responsibilities and support obligations—a neutral attorney associated with Hudson Valley Divorce Mediation is available to assist you in finishing up the legal requirements to have the court grant you a divorce. Instead of the neutral attorney, you have the option of using your own attorney to handle this part of the process. I am concerned about my legal rights. Mediation is not a substitute for sound legal advice from a qualified attorney. The mediators at Hudson Valley Divorce Mediation strongly advise you and your spouse to have independent legal advice on questions that have legal implications throughout the mediation process. In addition, you are encouraged to have your consulting attorney review the completed mediated agreement to ensure that you have not agreed to anything that is against your own interest. Very few situations are too complicated for mediation. The mediators at Hudson Valley Divorce Mediation are skilled at identifying component parts of a complex issue, and can help you approach the complexity one aspect at a time, as well as help you look at overall implications. If the complexity is about things such as an intricate business interest or a complicated tax situation, outside experts such as accountants, appraisers, actuaries, financial professionals and specialized attorneys can be consulted as part of the mediation process. We don’t get along; how can we possibly mediate? Although many couples are amicable and work well together in mediation, there are also couples who are very emotional about the divorce and do not think they can negotiate face to face. A professional mediator is trained to assist couples who have high emotions but who would still like to work things out collaboratively and peaceably. They often become effective participants in mediation when they see that the process can work without adding to the high emotional and financial cost of divorce. How do I find out if my spouse and I can negotiate face to face? There is no disadvantage to try mediation to see if the process works for you. You can discontinue at any time since participation is voluntary and you do not forego the option of starting or resuming litigation and legal proceedings. The mediators tailor their services to your needs. If you and your spouse would like to use mediation but indeed cannot negotiate face-to-face, we have strategies to handle such situations. How many mediators will we be working with? At Hudson Valley Divorce Mediation, we use a team approach. You will be working with two mediators. An attorney on our team can be available as a neutral attorney to finish up the legal requirements for your divorce. Thus the process is streamlined, efficient and cost-effective, designed to save you time, money, and emotional energy. This team approach also allows the mediators to offer you our insights and perspectives based on our diverse professional backgrounds, as well as a vast amount of combined experience working with many clients over the years. How do I know my spouse is being truthful? Mediation is a full disclosure process. Parties agree to fully disclose all financial information, validated by supporting documents such as income tax returns, bank statements, credit card bills, etc. Pensions and business interest can be valuated. Appraisals can be obtained for real estate holdings. 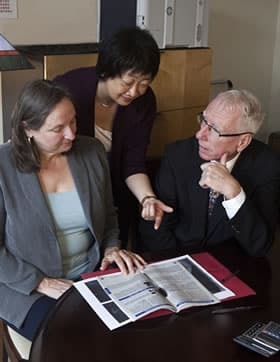 As information is assembled, both of you will have a clear picture of your assets and liabilities, which will enable you to negotiate a fair division of marital property and debts. Parents know their children best. They also know their own strengths as parents. They, therefore, are in the best position to make decisions regarding the care and support of their children. The mediators at Hudson Valley Divorce Mediation will guide you in making all child-related decisions. What if I need more help than mediation can provide? The mediators at Hudson Valley Divorce Mediation can provide information on mental health professionals, financial counseling services, consulting attorneys, and other outside experts, if you need them. Also available to our clients are books and resources on helping parents and children cope with divorce and separation. We may need an interim agreement. Is this possible? Yes, the mediators at Hudson Valley Divorce Mediation can help you draw up interim agreements to cover current issues while you work towards full settlement. We can write interim agreements on any issue of concern to you. For example, we can prepare a “move out” agreements to allow one spouse to move out of the marital home or a parent to relocate without fear that he or she has given up any of his or her marital or parental rights. What is the expected outcome of divorce mediation? A memorandum of understanding or MOU between you and your spouse is created when the mediation finishes. This MOU records the terms of agreement you and your spouse have reached during mediation. It contains everything you will need for the neutral attorney from our group (or your own attorney) to prepare your divorce settlement agreement to be filed with the court to get your divorce. Can I meet the mediators and ask questions before I commit myself to using mediation? You and your spouse are invited to schedule a free half-hour consultation session to meet us and ask questions. 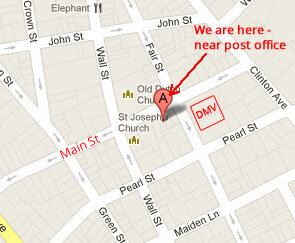 The office of Hudson Valley Divorce Mediation is located at 44 Main Street Kingston NY. By special arrangements, mediation can also be scheduled in Highland, Rhinebeck and Albany NY. Have we answered all of your questions? If not, we’d like another chance to do so. Our primary office is located in historic uptown Kingston NY, (exit 19 off I87). We're an easy drive from... All Ulster County locations: Saugerties, Woodstock, New Paltz, Marlboro, Stone Ridge, Kerhonkson, and Ellenville; and all Greene and Sullivan County locations: Catskill, Athens, Coxsackie, New Baltimore, Monticello and Liberty. Our Albany location is ideal for clients in Troy, Schenectady and northern Greene County.